Exchange is an exhilarating once-in-a-lifetime experience. From the diverse people you will meet to the exciting activities you will take part in, the opportunity will expand your horizons, change the way you view the world, and help you realize your true potential. In just a few month’s time, exchange will shape you to be the best version of yourself. But with every big decision that we have to make comes our common fears and inhibitions. What if it is difficult to go on exchange? What if I will feel alone when I get to the host country of my choice? What if I do not get the experience I envisioned myself to be in? Many exchange hopefuls are held back by the logistical difficulties they think they might encounter. After all, booking your flights, arranging your accommodations, and processing your visa is no walk in the park. On top of that, you have to coordinate with your host in the country of your choice, set expectations for the trip, and create an itinerary for yourself. Sounds pretty daunting, right? But never fear, AIESEC is here! An Exchange Manager from AIESEC in the Philippines will be assigned to guide you through your exchange journey— from beginning to end. Once you have successfully chosen an exchange country of your choice, your Exchange Manager will talk to you about the iconic exchange experience, provide you with an exchange brief to walk you through the planning stage, and consult with you about your expectations, fears, and everything in between. Even when you touchdown in your host country, your Exchange Manager will never leave your side. He will constantly ask for updates, check on you, and give you insights to help you make the most out of the experience. When you arrive back in the Philippines, your Exchange Manager will still be there to debrief you about exchange, ask questions about your trip, and synthesize all that you learned. Needless to say, you can be assured that AIESEC in the Philippines will hold your hand as you embark on exchange! Some people say that exchange will empty your wallet. Covering your expenses abroad can be costly, especially when you have flights, lodging, meals, and other things to spend on. Because of this, people think that they must have a large sum of cash before they can even consider to go on exchange. But this isn’t always the case! AIESEC does the best they can to make exchange affordable for everyone, because we believe that exchange is the greatest gift we can give the youth. Some exchange opportunities cover anything that you will need— from your accommodations, to meals, and everything in between. Other programs even offer monetary compensation for some students who choose to participate in their exchange opportunity. Now, everyone can go on exchange and enjoy the opportunities it has in store! A few aspiring exchange applicants believe that the top students are the top picks for exchange. People believe that the exchange application process is similar to the ones offered by their universities— applicants are ranked based on their academic standing, extra- curricular activities, and other endeavors, assessed on their backgrounds and abilities, then offered an exchange opportunity. Supposedly, only the best students are given an immediate exchange invite, while the lower ranked students do not make the cut at all. 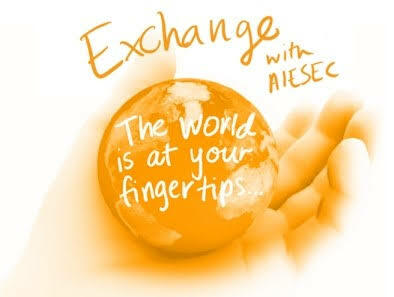 However this is far from the truth, unlike other exchange programs, AIESEC opens exchange to all! We believe that everyone has the potential to be a leader, so we allow everyone to go on exchange to explore their capabilities. We do not process applications based on your grades, org activities, amongst others. Rather, we conduct interviews to get to know you better— what topics interests you, what experience you are looking forward to, what kind of worker you are. From your answers, we will match you provide you with a shortlist of exchange opportunities that we think you will enjoy. With this application process in place, AIESEC ensures that all exchange participants get the experience they deserve and maximize their fullest potential! Most college students think that going on exchange means flying out during the semester, missing out on classes, and ultimately getting delayed. Since graduating on time is of utmost importance for most students, they completely forego their dream of participating in exchange. They lose sight of the life-changing opportunities that exchange can give them, simply because they are trying to chase the graduation clock. But time is never a problem with AIESEC exchange! You can go on exchange at any time, during any season, on any given date. All you have to do is choose an opportunity that fits perfectly into your schedule, apply for the program, and viola— you get to go on an exchange! Now, you can get the best of both worlds— you can graduate on time with all your block mates and friends, while enjoying the sights, wonders, people, and places when you are on exchange. Isn’t that great? Now that we have shattered these misconceptions on exchange, you have no more excuses to wait! Your exchange journey starts with your decision to make a difference, break free from your comfort zone, and explore the world around you. Finally, you can Create Tomorrow, Today with AIESEC exchange! 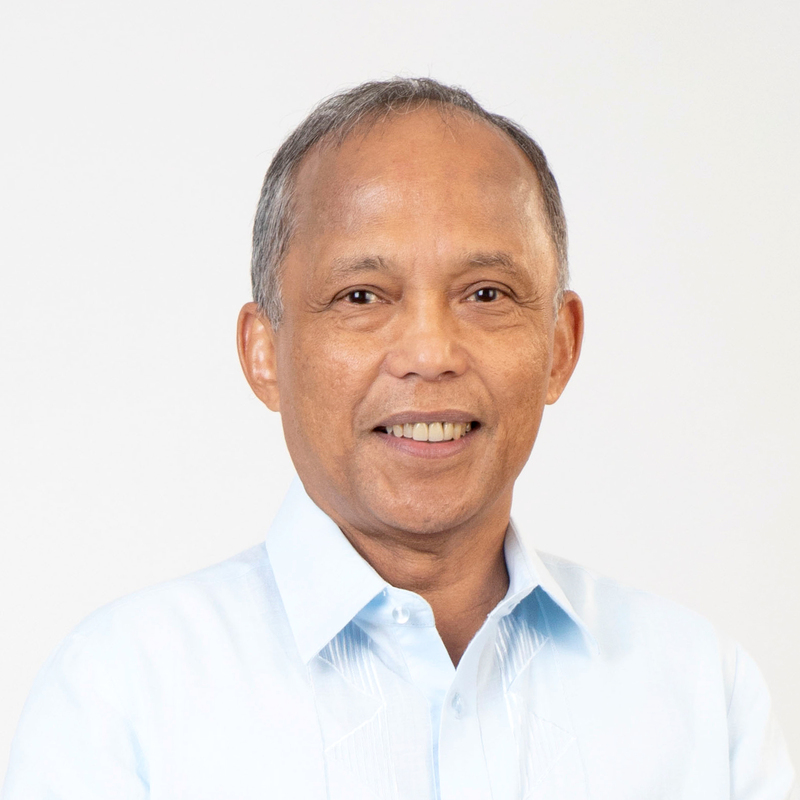 Reiterating previous calls to veer away from a “business-as-usual” attitude, Department of Energy (DOE) Secretary Alfonso G. Cusi launched yesterday (23 August) a department-wide “Mindset Revolution” Program (MRP) in a move to raise the benchmark of public service within the DOE. Under the MRP, all members of the DOE family are encouraged to self-reflect, particularly on how things are being done at the Department and transform them for the better. All officials and employees are invited to submit to the Office of the Secretary their ideas, suggestions or solutions that would further enhance the agency’s processes and overall functions, as well as foster the spirit of innovation within the Department. Proponents of proposals that will be implemented will receive, among others, a Certificate of Recognition and the fulfillment of translating his or her vision into action. Sec. Cusi further underscored that for deep-rooted developments to occur, such mindset revolution should start from within. “We should be the change we are espousing. If there are errors, let us immediately correct it. If there are blind spots, let us fix it. If something could be improved further, then let us do it. Mula sa atin para sa ikagiginhawa ng lahat,” the Energy Chief emphasized. University of Santo Tomas ruled Tour Manila Open, the sixth leg of the Beach Volleyball Republic’s BVR On Tour Series for 2018. University of Santo Tomas ruled both the men’s and the women's division, with UST’s Krung Arbasto and newcomer Jeron Requinton fashioning out a 21-19, 21-14 conquest of National University's Bryan Bagunas and James Natividad in the Finals. In the women’s division, Growling Tigress Sisi Rondina and Babylove Barbon scored a 21-18, 21-19 win over Perlas' Dzi Gervacio and Bea Tan in the gold medal match. For the bronze, Smart's team of Grethcel Soltones and Alyssa Eroa carved out a 21-12, 21-14 victory over Kempal's Roma Doromal and Chantal Rodriguez in the women’s division. University of Perpetual Help System Dalta's Jayjay Solamillo and Gilbert Balmores also achieved a podium finish, rallying from a set down to escape with a 12-21, 21-19, 18-16 win over Air Force's Ranran Abdilla and Jessie Lopez. The women's and men's champions took home P20,000 cash prize, with the second and third placers received P10,000 and P5,000, respectively courtesy of Maynilad. A total of 32 teams - 16 in the women's and men's division - joined the three-day spikefest where the best collegiate and professional beach volleyball players converged. 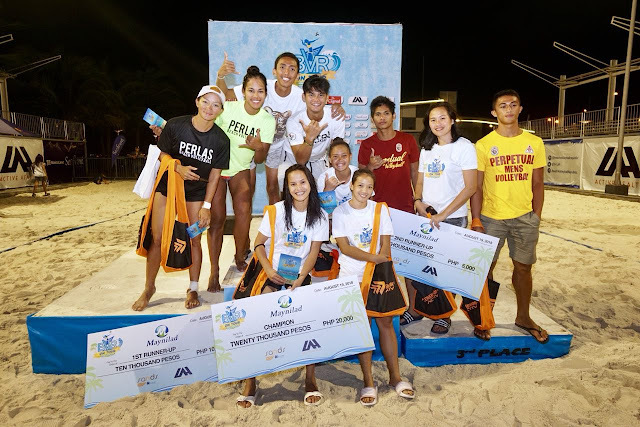 Water services provider Maynilad gave the Beach Volleyball Republic and beach volleyball a renewed boost by partnering anew with BVR for its just finished Tour Manila Open tournament at Sands SM By the Bay. Maynilad became the beach volleyball circuit’s official hydration partner beginning with the highly-successful FIVB Beach Volleyball World Tour Manila Open last May. All players who participated in this leg were hydrated by ice cold Maynilad bottled water. "We’ve been blessed to have long-term partner in growing this sport and I’m very happy that Maynilad has been there to support us in our legs this year," said BVR founder Charo Soriano. "I would to thank the players who competed. We all know that you trained so hard for this tournament," said Soriano during the closing ceremony. The Manila Open is the 32nd leg of traveling beach volleyball tournaments organized by the BVR since it began in 2015. The Department of Energy (DOE) received a commendation from the Commission on Elections (COMELEC) today for ensuring sufficient power supply during the nationwide Sangguniang Kabataan Elections on 14 May 2018. COMELEC Acting Chairman Al A. Parreño presented the award to DOE Secretary Alfonso G. Cusi in appreciation of the Department’s unwavering commitment to protect the country’s democratic processes through genuine public service. In support of the Duterte Administration’s objective to ensure orderly and peaceful elections, the DOE convened the Task Force on Energy Resiliency (TFER) in May. The TFER is composed of representatives from the National Electrification Administration, National Grid Corporation of the Philippines, National Power Corporation, National Transmission Corporation, Philippine National Oil Company, and the Power Sector Assets and Liabilities Management Corporation. The Task Force also worked closely with the national security group, which included the National Security Council, Armed Forces of the Philippines, Philippine National Police, Bureau of Fire Protection and the Philippine Coast Guard during the election period. The Maritime Industry Authority (MARINA) beefs up its preparations for the International Maritime Organization (IMO) Member State Audit Scheme (IMSAS) scheduled in 2021. To ensure the preparedness of the Philippine maritime industry for the mandatory audit, the MARINA drafted a proposed bill to ensure the country’s implementation of five (5) IMO conventions, specifically the Safety of Life at Seas (SOLAS), International Convention for the Prevention of Pollution from Ships (MARPOL), Convention on International Regulations for Preventing Collisions at Sea (COLREGS), International Convention on Load Lines, and International Convention on the Tonnage Measurement of Ships. “The proposed bill is a proof of MARINA’s proactive approach to the issues confronting the Philippine maritime industry. With this, we hope to boost our collaboration with the legislators in passing laws that will enable the Philippines to effectively implement IMO conventions,” MARINA Administrator Rey Leonardo Guerrero said. The MARINA actively facilitates the translation of international maritime laws into national legislations in the performance of its obligations and responsibilities as an IMO member. In fact, MARINA aligned its proposed bill with House Bill 456 which ensures full and effective implementation and enforcement of several IMO-issued conventions to promote maritime safety and security. The MARINA’s proposed bill will support the implementation of House Bill 456 once it is finally passed into a law. MARINA Legal Service Director Atty. Maximo Banares, Jr. explained that the proposed bill aims to address the gaps in the mandates of maritime agencies. “Our proposed bill will ensure proper delegation of authorities among maritime agencies by determining which should be given full and complete effect to a particular IMO convention,” Atty. Banares said. As part of its preparations for the IMSAS, the MARINA also conducted a mock audit of the country’s compliance with IMO agreements in the second quarter of 2018. Corrective action plans for the local maritime industry were developed based on the results of the mock audit. The Department of Transportation (DOTr) is pushing for the development of other gateways to complement the Ninoy Aquino International Airport (NAIA) and the Clark International Airport (CRK). At least two airport development projects are now being prioritized --- building a new airport in Bulacan and developing the Sangley airport in Cavite. This airport complementation strategy is aimed at decongesting NAIA, give travelers more options, and spread development across Luzon. “The idea of having multiple airports is something that the world’s biggest economies do. Ideally, there should be a train service linking these airports, which is also being pursued by the government. This complementation strategy was already part of the air transport roadmap from day one, and rest assured, that’s what we are going to do,” said Transportation Secretary Arthur Tugade. The new Bulacan airport, an unsolicited proposal from the San Miguel Holdings Corp. (SMHC), was approved by the National Economic Development Authority (NEDA) Board last April 25, subject to resolution of pending issues, including a submission of “Joint and Several Liability” agreement by SMHC and its parent company. After submitting the revised Concession Agreement, along with the Risk Allocation Matrix, the NEDA and the Department of Finance (DOF) submitted their comments last August 9, and are now under consideration of SMHC. After which, the DOTr will commence negotiations with SMHC to finalize the draft Concession Agreement and submit the same to NEDA ICC, and finally begin the Swiss Challenge process. The proposal includes the building of 4 parallel runways and a passenger terminal with 100 million passengers capacity per year. Meanwhile, the DOTr also welcomes the proposal of the Provincial Government of Cavite to develop the Sangley Airport. The approval process, however, will be defined after the Cavite LGU has determined the legal framework for its implementation. While these projects are being developed, the Manila International Airport Authority (MIAA) Board has already approved the grant of original proponent status to the NAIA Consortium for the airport’s rehabilitation project. The concession period will run for 15 years. Secretary Tugade added that apart from these airports in Luzon, several other airports are undergoing various stages of implementation. Among them is the new Bohol (Panglao) airport, which will be opened within the year. The Bicol International Airport in Albay is now also being constructed after 11 years of delay. The Siargao and Bukidnon airport are also in the works. “Apart from these new gateways, we are improving our existing provincial airports. We are extending and expanding runways, building new passenger terminal buildings, and generally improving the facilities,” added Tugade. “A one-way traffic flow is the most efficient traffic circulation scheme for BGC’s street grid network because it maximizes the width of the street that is available for traffic, reduces the conflicts between vehicles and pedestrians at intersections, and minimizes the time that vehicles and pedestrians are stopped at traffic signals. 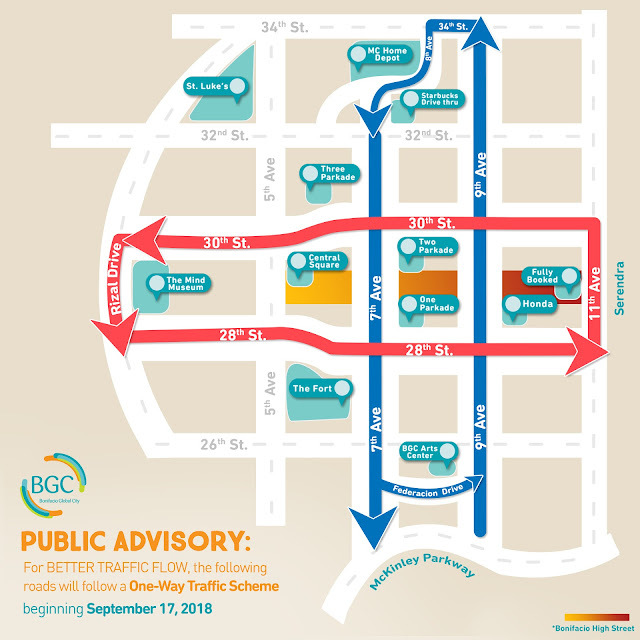 Overall, BGC should become less congested and faster to travel in with a one-way traffic scheme” said Bonifacio Estate Services Corporation General Manager, Jun Galvez. BGC, as one of the country’s top central business and lifestyle districts, is rapidly developing with high-rise condominiums, offices, shopping malls, entertainment centers, museums, and educational institutions. These developments attract traffic from all over Metro Manila and in addition, a large volume of pass-by traffic between C-5, EDSA and Makati passes through BGC which creates congestion during rush hours. The one-way traffic scheme is intended to address this large volume of vehicles that go to and pass through BGC. A similar one-way traffic scheme was implemented in the Makati CBD in the past which reduced traffic congestion and improved travel time in the area. To make sure that the new one-way scheme will become effective, BGC will continue its existing wheel clamping and towing operations to curb illegal street parking and keep its major streets free of obstructions. To further reduce the incidence of illegal parking, BGC recently launched an app for both iOS and Android devices to help motorists easily find parking spots within the city. For further information on BGC’s traffic rules, visit the official Facebook page facebook.com/bonifacioglobalcityph. This refers to the social media post of MRT-3 passenger Ms. Miriam Cabiles on August 22, 2018. In the post, she stated that she was unfairly asked to pay an "overstay charge" due to overstaying within the paid area of MRT-3. Please note that the MRT-3 allows a passenger to stay within the paid area for a maximum of 2 hours (not 1 hour as stated in Ms. Cabiles’s post). Prescribing a maximum stay period is a standard railway operating procedure that is implemented for security reasons and to avoid the turnback of passengers. - Ms. Cabiles entered the paid area of Cubao Station at exactly 7:17 AM. - Per Ms. Cabiles’ post, she was able to board a train at around 8:45 AM. - Between her entry in the paid area at 7:17 AM and her reported boarding of a train, 10 regular trains and 2 skip trains stopped at Cubao Station. - The 1st skip train only loaded a few passengers in GMA Station and arrived in Cubao Station at 7:25 AM. - The 2nd skip train only loaded passengers in Quezon Ave. Station and arrived in Cubao Station at 8:06 AM. - Per Ms. Cabiles’ post, it is unclear but it appears that she stayed inside the paid area of Cubao Station (i.e., pass the turnstile) between 7:17 AM and around 8:45 AM, or around 1.5 hours before boarding a train. - It is still being investigated why Ms. Cabiles has not boarded a train despite the 10 regular trains and 2 skipping trains that stopped in Cubao Station during the 1.5 hours that she was already inside the paid area (i.e., pass the turnstile). - Ms. Cabiles tapped her Beep card at the exit gate of Buendia Station at exactly 9:28 AM. - Assuming that Ms. Cabiles arrived in Buendia Station at 9:15 AM as stated in her post, it is again still being investigated why it took her 13 minutes (i.e., from 9:15 to 9:28 AM) to exit Buendia Station after alighting from the train. - Ms. Cabiles eventually exited Buendia Station at 9:33 AM after paying the overstay charge. - Ms. Cabiles was the only passenger who boarded in Cubao Station and alighted in Buendia Station who was charged the overstay charge. It is still being investigated why the other passengers that entered Cubao Station at the same time as Ms. Cabiles and exited at Buendia Station at the same time as Ms. Cabiles were not identified by MRT-3’s Automated Fare Collection System (AFCS) for having overstayed. It appears unlikely that Ms. Cabiles was the only passenger that boarded in Cubao Station and alighted in Buendia Station at that time. - For Aug. 22, MRT-3’s AFCS recorded a total of 12 passengers, at different stations, who overstayed and were charged the overstay charge. MRT-3 carried 341,452 passengers on Aug. 22. On a more general level, MRT-3 wishes to note that in cases where there is a big volume of passengers who will be charged the overstay charge at the same time in a particular station, for example due to lack of trains or any service interruption, the Station Supervisor may override a turnstile so that affected passengers may exit without paying the overstay charge. This is part of MRT-3’s standard operating procedures. DOTr and MRT-3 will continue to monitor and review the appropriateness of the 2-hours overstay parameter given the operating condition of MRT-3, and will also remind Station Supervisors to follow standard procedures in cases of service disruption or fewer than usual train availability (e.g., by overriding the overstay parameter in the turnstiles), with the objective of realizing both objectives of deterring overstaying and turnback of passengers for security reasons, and ensuring that passengers are not penalized for situations beyond their control. We thank our passengers for the continued patronage, and we assure you that we are constantly reviewing our policies and operating procedures to ensure a better travel experience for our riding public. 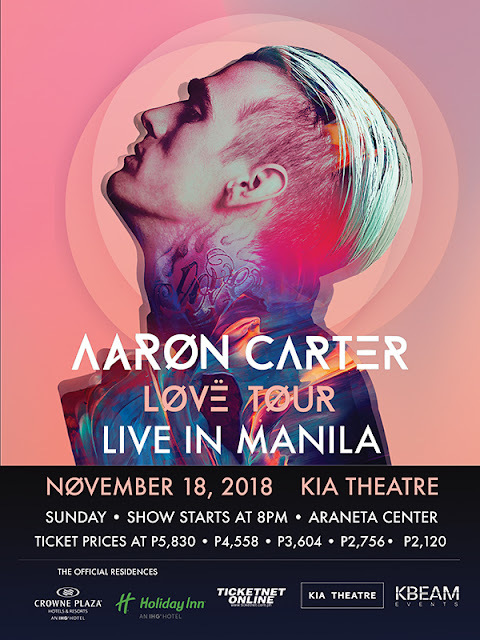 Kbeam Events officially announces the upcoming concert of 90’s teen sensation, Aaron Carter dubbed as “Aaron Carter LØVË Tour Live in Manila” on Sunday, November 18, 2018 at the Kia Theater in Araneta Center, Quezon City. 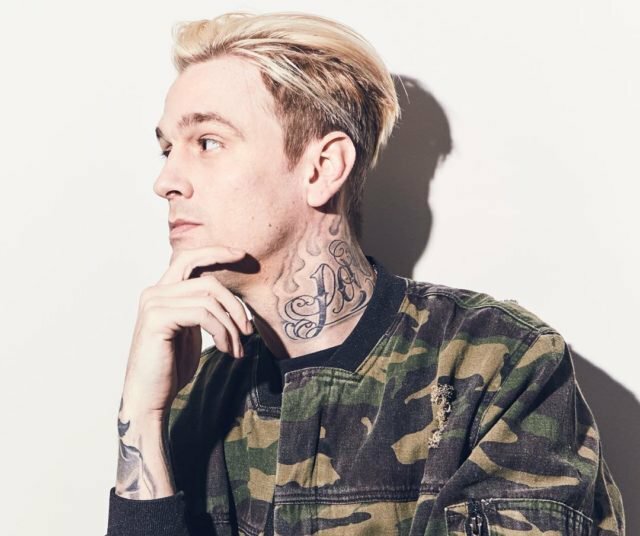 Now 30 years old, Aaron Carter, has been spending the year touring the US and UK headlining in his own shows, as well as joining his fellow 90’s greats like boyband O-town, Lance Bass from NSYNC, Ryan Cabrera, and Youtube sensation, Tyler Hilton. Upon learning that he’s now back on tour, fans from the Philippines via Twitter started requesting the singer to come to Manila for a concert. The last time he was here was in 2002 and he was only 14 at the time when he performed at the Araneta Coliseum. Today, Aaron Carter heard his fans loud and clear and he is now schedule to perform at the Kia Theater at 8pm on Sunday, November 18, 2018. Aaron Carter will feature songs from the latest album LØVË, which is distributed by Sony Music. Tickets to Aaron Carter Live in Manila are now on sale at all Ticketnet outlets (call 911-5555) and at Ticketnet.com.ph. Prices are at P5,830, P4,558, P2,756, P2,120. This concert is presented by Kbeam Events and the official residences Crowne Plaza Manila Ortigas and The Holiday Inn Manila Ortigas. Catch ‘Crazy Rich Asians’ Nico Santos and Ken Jeong on Sony Channel’s Sitcom Series! Find Nico Santos from the hit movie ‘Crazy Rich Asians’ familiar? 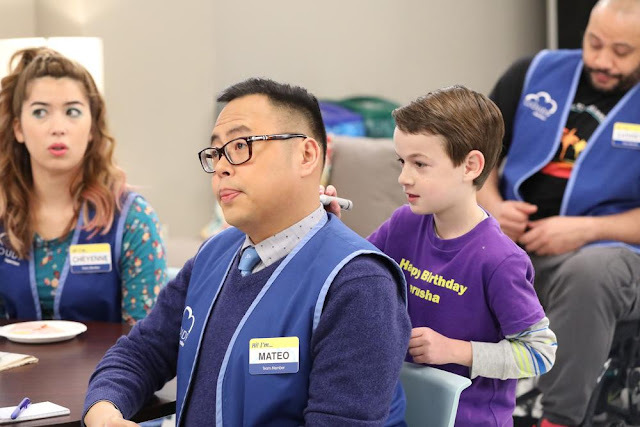 He steals all the scenes as Mateo Liwanag on ‘Superstore’! Superstore is a sitcom about an odd and colorful mix of store employees. Current season airs every Sunday at 8pm first and exclusive on Sony Channel. Is laughter the best medicine? 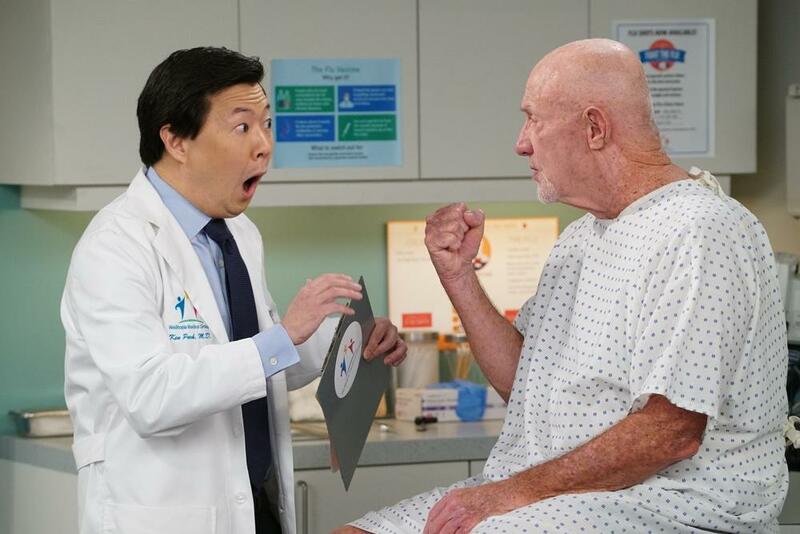 Ken Jeong plays Dr. Ken in this hilarious sitcom about a doctor with questionable bedside manners. Catch more laughs all weekdays at 8:35am (encores at 4:30pm), beginning September 20 first and exclusive on Sony Channel. The Department of Transportation (DOTr) yesterday served the order to dismiss from the service Atty. 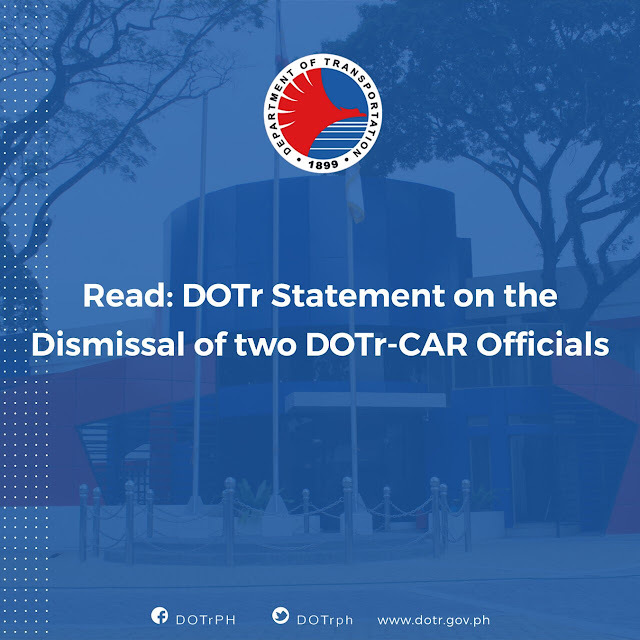 Jesus Eduardo Natividad, Regional Director in the Cordillera Administrative Region (DOTr-CAR), and Datu Mohammad Abbas, Assistant Regional Director of the DOTr-CAR, after being found guilty of administrative offenses and corruption charges. Unfortunately, Mr. Abbas refuses to obey the order, saying only President Duterte can terminate him because he is a presidential appointee. For the record, Mr. Abbas does not hold any appointment paper from President Duterte. He was appointed by the previous administration, and is serving the DOTr-CAR on a hold-over and acting capacity. A replacement has already been appointed. Mr. Abbas was dismissed after several stakeholders in Baguio City and the Cordillera region alleged him of misconduct. Among the charges include accepting money to facilitate the issuance of Certificate of Public Convenience (CPC), extortion in exchange for the release of impounded vehicles, accepting commissions from medical and notarial fees relative to franchise applications, as well as Conduct Prejudicial to the Best Interest of the Service for brandishing and toting a gun against a certain clinic employee. After painstaking scrutiny and careful evaluation of the statements and affidavits, the DOTr found Mr. Abbas guilty of administrative offense of Grave Misconduct and Conduct Prejudicial to the Best Interest of the Service with the penalty of dismissal from the service. Meanwhile, Atty. Natividad was found guilty of Gross Neglect of Duty after he issued a CPC for a U-Hop application within the moratorium period. The dismissal order also comes with accessory penalties of cancellation of eligibility, forfeiture of retirement benefits, and perpetual disqualification for re-employment in the government services. Even though content has already assumed great importance in SEO, AI is expected to become its driving force soon. It is expected that other on-page activities like keywords, technical issues, backlinks, etc. will take a backseat. Things like keywords, content structure, design, graphics, linking, etc. that partially affect SEO now will assume greater importance with AI being able to assess the quality of a webpage instantaneously. 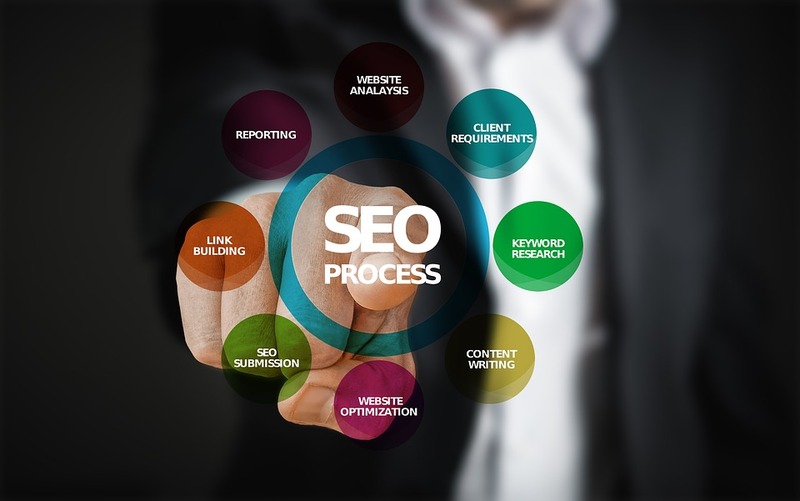 SEO will need to verify that the content is relevant and of high quality and that it satisfies the intent of the user while providing an experience that is positive. Ultimately, the content should drive users towards conversion. With data being machine processed, failure will invariably tank the page rankings immediately. Title tags, URLs, Meta descriptions, alt texts, etc. while continuing to be important will no longer drive SEO as it does today. AI algorithms will easily be able to identify strategies that fail to add value to user experience, design, and content; forcing SEO practitioners to monitor and enhance their efforts. AI will put an end to black hat SEO techniques and also diminish the importance of organic links that drive contemporary SEO. With Google’s AI expertise being able to understand the page contents, assess its value, and also analyze the relevance and value of links, search rankings will no longer be manipulated, according to experts . 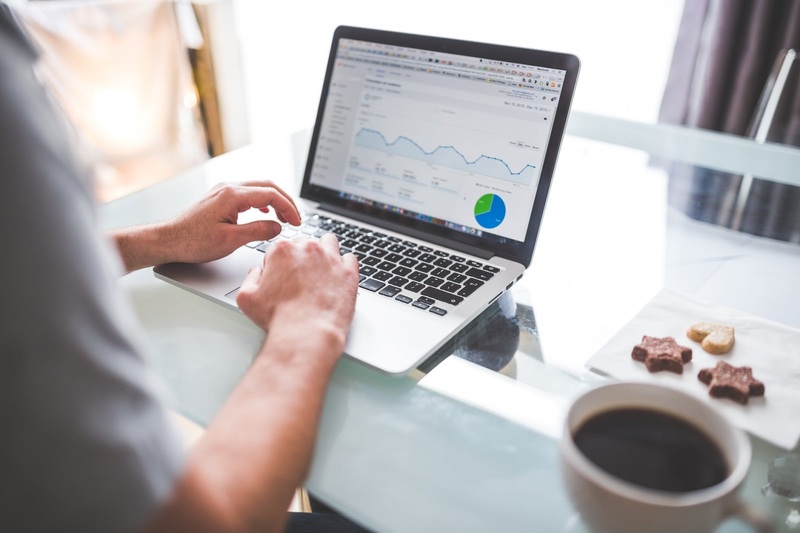 Technical knowledge and skills will become far less important in SEO with Google being able to diagnose and auto-correct technical errors on your website. Today Google is encouraging the adoption of technologies like Alexa, Google Home, and Amazon Echo simply because it wants to access sites for analyzing and ranking them; not having the initial data, the AI prowess is left useless. 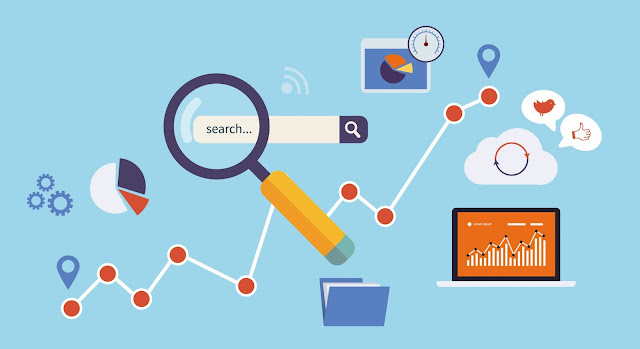 Unlike many technical aspects of SEO, UX quality will continue to grow in importance and be a key ranking factor. Today, if you want to know whether users have been enamored by a specific webpage, the best indicators are user engagement and the click-through rate. However, with time Google is expected to refine its AI capabilities to such an extent that it would be able to understand the level of user satisfaction just like a human and be able to rank the site accordingly. 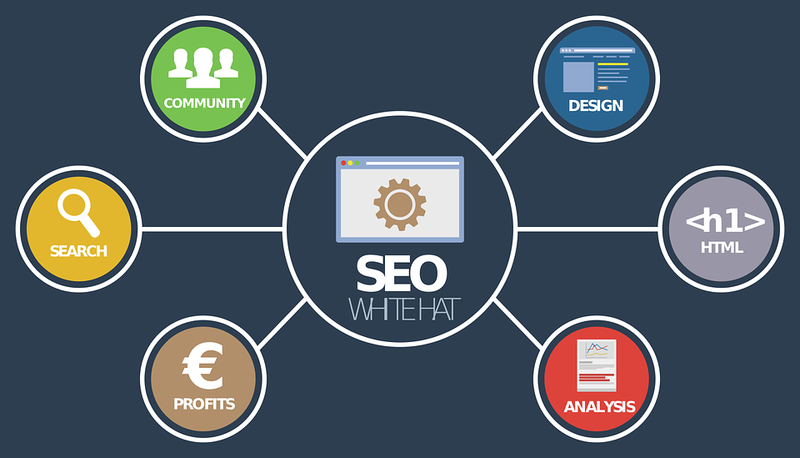 All those involved with the website, not only the SEO team but also digital marketers, designers, developers, etc. will need to get their act together to ensure that there are no flat spots in the UX. The AI implementation will make Google even smarter and lend it the power to assess the true value and utility of websites very much like a human being but without the mistakes and biases. The technology will permit instantaneous assessment of whether the user’s intent has been met and a page rank allocated. Whenever the analytics questions run into edges of latest tools, it is time to head towards database for analytics. It is not a clever idea to construct scripts to query production database. Chances are high that you might delete vital info accidentally if you have engineers or analysts poking around over there. At that point, you need separate form of database for analysis. Which is the right one to choose? While working with lots of customers to get DB up, the most interesting criteria are the amount of data you possess, type of data to analyze, focus of your engineering team and how fat you need it. Check out for the data you are planning to analyze. Will it fit well into columns and rows or would it be more appropriate into Word Doc? When it comes to Excel, relational database like MySQL, Postgres, Amazon Redshift or even BigQuery might be the ones to consider. These are relational structured databases, which are amazing when you are aware of the data to receive and how it might links together. It basically works on ways in which rows and columns relate. For major user analysis, relational database will be the perfect one for you. Some user traits like emails, names and billing plans will get nicely into table just like user events and the significant properties. In case, the data fits better on paper, you might have to check for non-relational database or NoSQL like Mongo or Hadoop. The non-relational ones work well with larger data points of semi-structured plans. Some classic examples of semi-structured data are social media, email, books, audio and visual aids, and even geographical data. In case you are working on larger amount of text mining, image or language processing, you may have to visit non-relational data stores. You can get information on that from RemoteDBA.com now. You need to know the amount of data you are planning to get hands on. 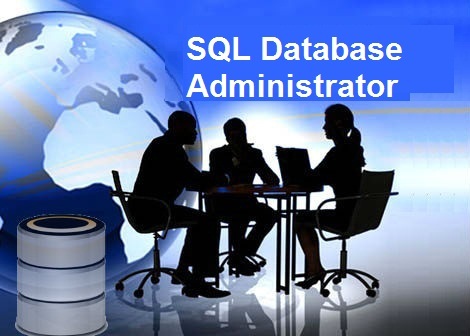 The more amount you have, the non-relational database will be the most helpful option for that. NoSQL is not going to impose any kind of restraints on incoming data, which will definitely allow you to write a lot faster. For <1TB, you can use Postgres MySQL. Then you have Amazon Aurora for 2TB – 64TB. Amazon Redshift and GoogleBigQuery are the major databases for 64TB to 2PB. And lastly you have Hadoop for covering all the data sizes as mentioned right now. Well, there is no strict limitation as each database can handle an amount depending on multiple factors. For under 1TB data, Postgres helps in offering a good performance ratio price. But it might slow down around 6TB. In case, you are looking for MySQL but with a bit more upscale, you have Aurora, which can go up to 64TB. In case of petabyte scale, Amazon Redshift is the best bet as it can be well-optimized for running analytics for up to 2PB. In case, you are looking for parallel processing or more MOAR data, you can always try out for Hadoop. Another important question asked by experts from RemoteDBA.com during database discussion is to check on the engineering team and its focus center. The smaller this team might get, the higher are your chances to need engineering focusing on building product and not on database management and pipelines. The number of people dedicated to work on your project will affect your options more. With engineering resources, you have vast array of choices. You can either opt for non-relational or relational database. Relational DBs are likely to take less time for managing when compared to NoSQL. If you have engineers working on setup but cannot find any help with the maintenance, you can focus on using Google SQL, Postgres or even Segment Warehouse any day over Aurora, Redshift or BigQuery. When you have enough time in hand for maintenance, then you can select BigQuery or Redshift for faster queries at larger scale. Relational database covers another advantage. SQL can be used for query. SQL is known among engineers and analysts and quite easier to learn when compared to other programing languages. Moreover, running analytics on semi-structured data will require object oriented programming based background or a code based science background. With some recent inventions of analytics tools like Hunk or Slamdata, analyzing such database types will always need help of an advanced data scientist or analyst. Even though real time analytics is quite popular nowadays for covering cases like system monitoring and fraud detection, moist analyses will not even need real time data or even immediate insights. Whenever you are answering questions like what causes users to churn or how people are currently moving from app to website, accessing data with slight lag is more or less ok. Your data won’t change every minute. So, if you are planning to deal with after-the-fact analysis, you have to go for database as designed under hood for accommodating larger data amount and to read and join data quickly. That will make queries work faster than usual. This step might also load data fast reasonably only if you have someone resizing, vacuuming and even monitoring the cluster. In case you are direly in need of real-time data, you have to check for some unstructured database, such as Hadoop. You can easily design that database for loading rather quickly even when queries can take long time to scale, based on RAM usability, disk space availability and how the data has been structured. Once you are sure of the right database to use, it is important to figure out ways to get you data involved with database. It is hard for newbies to actually build scalable data pipeline. That’s why experts are always down to offer some crucial help. It takes time to find the right team, but once available, their services are worth it. 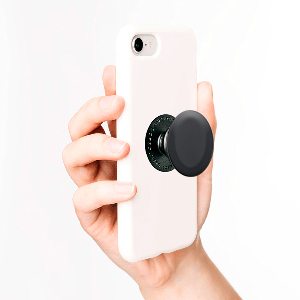 The hit mobile phone grip is now available in the Philippines. In 2010, Philosophy professor David Barnett had a problem: when getting his groove on listening to music on his phone, his earphones got tangled. 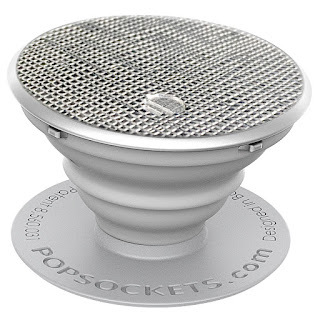 In a moment of genius, he glued a button to the back of his phone to keep the cord neatly wrapped – this was the moment when the seed for PopSockets was planted. Fast forward to today, that simple button had expanded into a simple device that really did work great as a cord wrap, but also as a handy phone grip and a phone stand too. 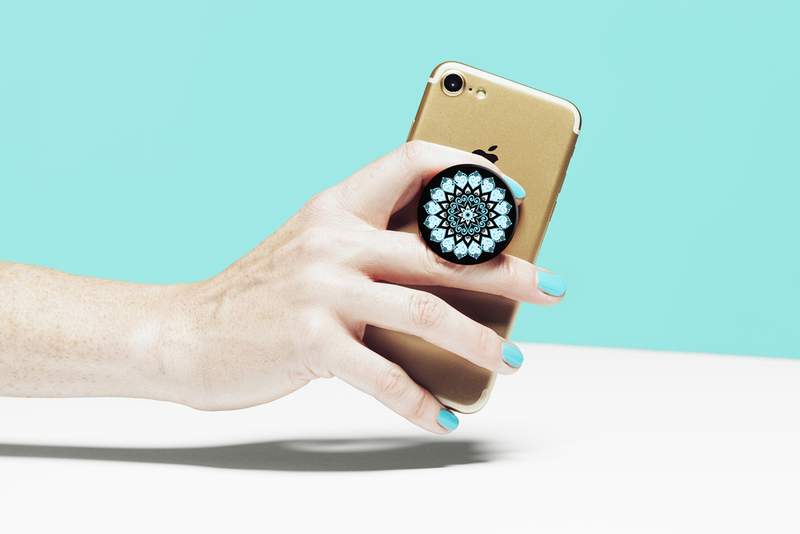 So What’s A PopSockets Grip? It’s that simple thing you never knew you needed but now can’t live without. PopSockets Grip offers a secure grip for texting or snapping that perfect selfie, and propping your phone up for catching the latest video. Double PopSockets Grips are great for competitive mobile gamers who want a solid grip on the base of their phone to put their twin thumbs into action. They are also a great tool to store untangled earphones by simply winding them over the knobs. With the PopSockets Mount, you can hang your phone just about anywhere. 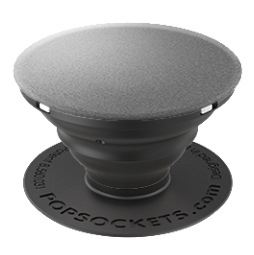 Your PopSockets Grip slides easily into the Mount for hands free function while driving, video chatting and more. It may have started out of David’s garage but PopSockets soon became a commercial success. It is a huge hit with many fans including celebrities such as Kendall and Kylie Jenner, Fifth Harmony, Serena Williams, Gigi Hadid, Jared Leto and Michael Phelps. 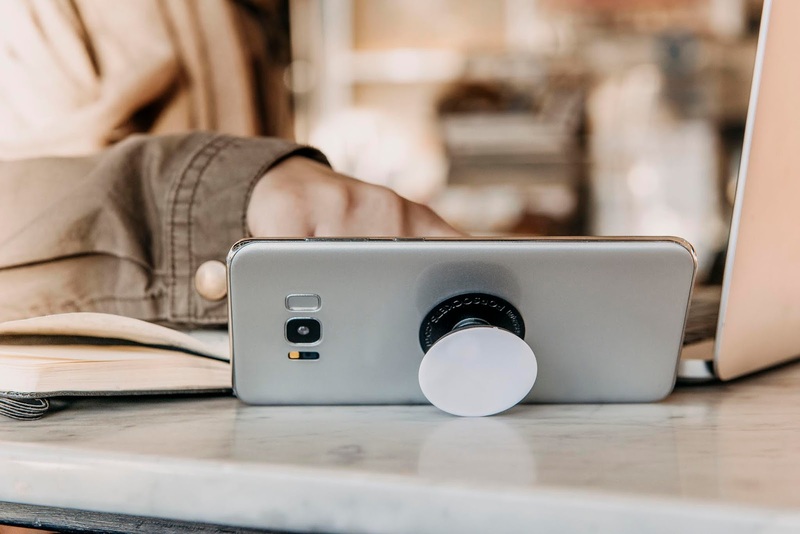 The company has sold over 35 million PopSockets Grips and Mounts in 2017 and is on track to double that number to 70 million this year, including its expansion into the Philippine market. 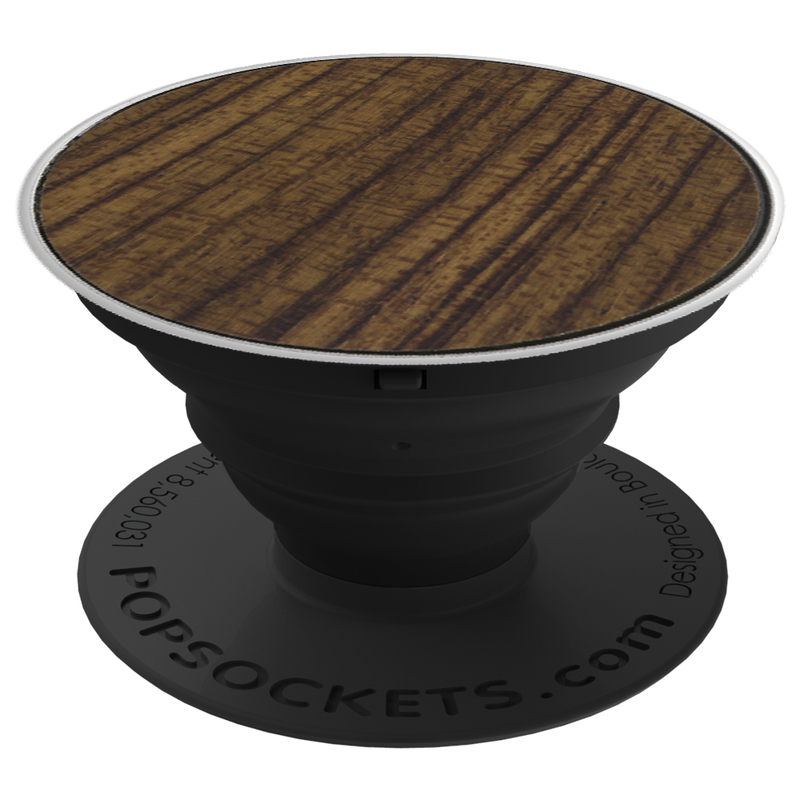 PopSockets are phone grips and stands that are collapsible, customizable, and re-positionable. PopSockets have over 100 designs priced at PHP 499 for the original designs, PHP 749 for the licensed designs (such as Harry Potter and Marvel) and the designs that are made of premium materials such as leather, metal and wood. PopSockets Grips have over 100 various original designs priced at P499. It is also available in designs made with premium materials such as Vegan Leather, Metal and Real Wood for P749. Licensed designs from well-known franchises such as Harry Potter and Marvel, which will be available in the next coming months, are also priced at P749. 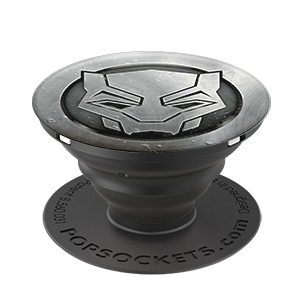 PopSockets also offers combo pack comprised of 1 black PopSockets Grip and 1 mount for only P749. 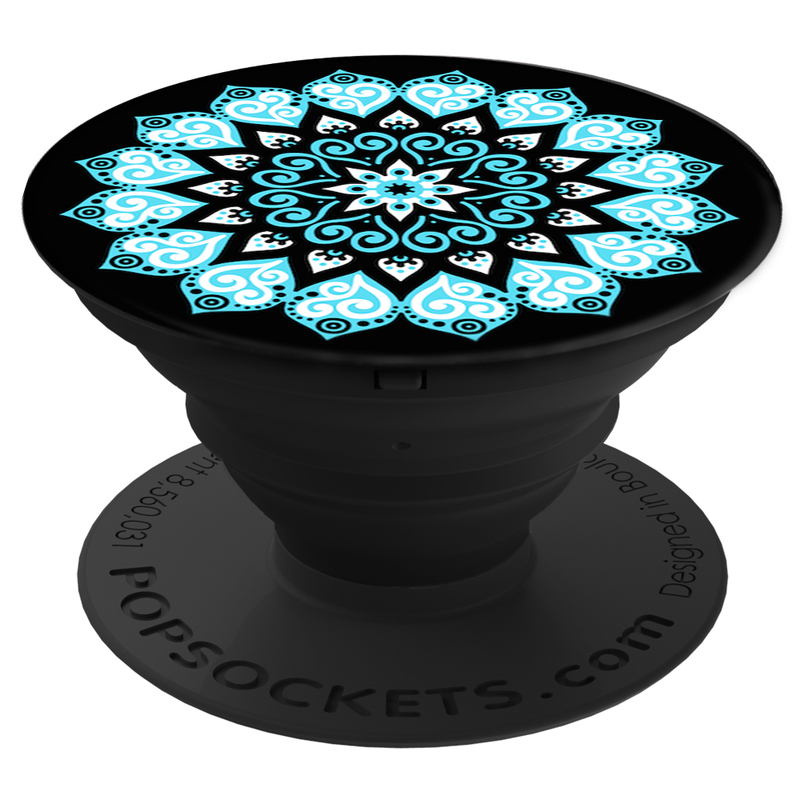 You can also purchase PopSockets Mounts on its own for P499. Department of Energy Secretary Afonso Cusi again clarified that the Department’s directive for oil companies to provide Euro-II compliant diesel fuel - is meant to provide a cheaper diesel alternative, particularly for those operating older vehicles in the public transport sector. “The DOE is actively finding ways to help control inflation. Bringing in Euro-II compliant diesel fuel gives our countrymen an additional option. Euro-II diesel matches diesel engines without the catalytic converter. These are usually the 2015, 2014 and earlier models of vehicles,” Sec. Cusi said. In particular, the Energy Chief said those owning older vehicle models from 2015 below, particularly in the transport sector, would benefit from additional savings that the Euro-II diesel fuel would provide. “With rising prices, each centavo of savings counts,” Sec. Cusi noted. To ensure proper implementation of the Energy Secretary’s directive, the DOE-Oil Industry Management Bureau (OIMB) required all oil companies to submit their respective implementation programs by the 24th of August 2018. In their respective implementation plans, the oil companies are expected to indicate the participating retail outlets, the date of intended implementation and other related information for the provision of an additional diesel fuel alternative. Likewise, the DOE assured consumers that it would continue the stringent monitoring of the quality of fuels being sold in the country. "We empower our consumers when we give them the ability to choose. We are enhancing the competition among the suppliers. This is what the Euro-II diesel option is all about,” Sec. Cusi said. Are you looking for gifts for a dog lover? If you know someone who is a true dog lover, then you must be aware how much fond of their dog they must be, right? How about making them feel special by gifting them something unique? Today, you get ample of options in dog gifts, both readily available in the market and on the Internet. Don’t worry, we will guide you with the best gift ideas for dog lovers. Below are a few options to gift the dog lover. Let’s have a look! 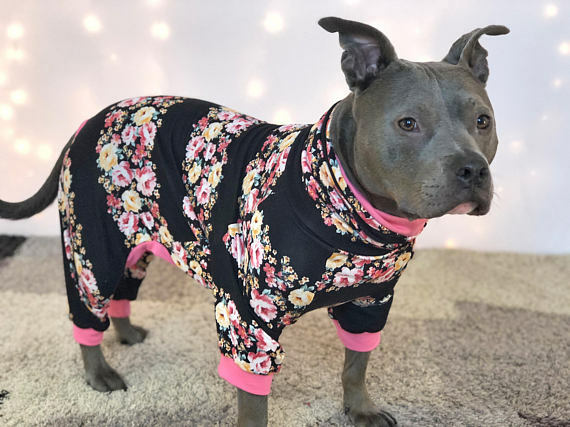 Breaking all the odds of traditional dog lover gifts, you can gift them with cute dog pajamas. Yes, you read it! You get a massive collection in dog pajamas these days online, all you need is to know is the right age of the dogs. Whether it is big or small dog pajamas, you can get all on the Internet. Imagine, how cute the dogs will look wearing them. One useful gift, right? Gone are the days when only a plain colored leash was available for the dogs. Now, you can get dog leashes in stunning colors and designs. You can either gift a set of a few different colored leashes or gift only a single leash. The choice is yours! Food is what makes our dogs lively, right? What better than gifting a pack of dog treat? Not just the gift is used for the owner, but also make their dog happy. From Earth animal no-hide treat to all natural dog treats, you get everything online. Nothing better than a comforting bed, right? Well, the same goes for the dogs. They love to sleep in their sweet corner. Why not gift them a dog bed? This gift will add to their corner and will provide them with a sound and safe sleep. Another great idea for gifting the dog the lover is to gift toys for their dogs. Playful yet useful, isn’t it? Dogs love to play, whether it a squishy fun silicon toy or a simple soft tennis ball, your dog will enjoy the gift to the fullest. This gift will help the dog stay fit and healthy. Dog packs, sounds fascinating, right? Customize the pack and include all the dog essentials, toys, clothes, leashes, and other dog accessories. Make it a big pack and gift them. Simple wow! This is one of the best options if you are on a good budget and looking for something grand. Yes! You can get a wide array of options in dog lover jewelry. Gifting your friend with dog-shaped jewelry will surely bring a smile on their face. It’s unique and impressive, isn’t it? So, what are you waiting for? Choose the best option and make purchases. You can easily buy all of these options at Koa’s House. They offer a lot of options in dogs and cats accessories. Visit their website to know more details. Choose wisely! Fortinet, a global leader in broad, automated, and integrated cybersecurity solutions, today announced that Fortinet and IBM Security will collaborate through the bi-directional sharing of cyber threat information. IBM Security has been a Fortinet Fabric-Ready partner since 2017. 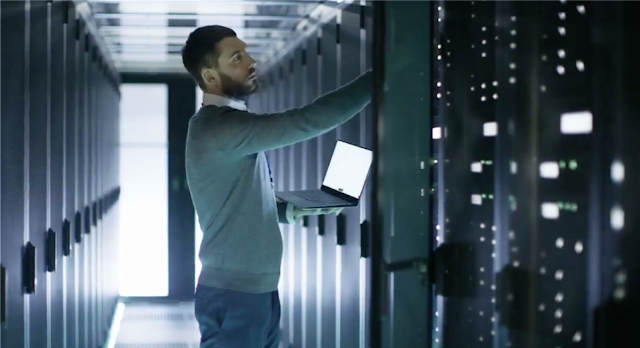 Fortinet’s open approach extends the broad visibility, integrated threat prevention, and automated response of itsSecurity Fabric architecture through well-defined APIs to IBM for unified security management and security incident response.